What is SIP Trunking and how does it work? SIP is a popular VoIP protocol and de-facto standard in today’s technological world of communications. SIP trunking allows IP PBX systems to connect various locations of a company’s offices by using VoIP (as opposed to sending calls via a traditional PSTN network and thus paying local telecom operators). So, for example, a call travels over the Internet from an IP PBX in office A to the Internet telephony service provider (ITSP) VoIP Softswitch – where it is then routed to the IP PBX in office B. There are zero per-minute costs for these calls and the service is typically billed based on the maximum allowed number of connected calls (these are “trunks”). Although standard SIP trunking usage allows companies to save costs on calls between extensions / employees – the real benefit comes from its ability to route outgoing long-distance and international calls via a VoIP at a reduced rate – or easily allocate phone numbers (local, toll-free or international) for inbound calls. In addition to connecting voice calls, - a frequently sought after value-added service is fax delivery via VoIP using a T.38 protocol, which ensures quality and best of all, saves costs. What motivates enterprises to sign up for SIP Trunking? Customer wants to have various incoming phone numbers (toll-free, in different cities or even different countries) and / or advanced features (such as call recording). SBC provides a high-availability control point for all network communications, to keep the service continually accessible. It protects your network from denial-of-service (DoS) attacks (that can occur when either a malicious or misconfigured device attempts to flood the network with messages). It also limits call initiation ratio per endpoint (IP PBX or SIP phone) – allowing you to properly allocate the call capacity to individual customers. This way a customer who initiates a sudden call burst (e.g. from an outbound call center campaign) does not affect other customers. Voice and video calls, fax-over-IP (T.38) and SMSs (e.g. for marketing campaigns or customer alerts). Integrated Billing is used for configuring a customer’s service parameters such as methods of authorization, credit limits, “normal calling” profiles (in order to quickly detect any abnormal activity), number of purchased trunks and calls-per-second thresholds. There is a real-time data link between B/OSS and Softswitch, so any changes are instantly effective, no additional configuration is required. Permitting "soft" and "hard" trunk limits, wherein all usage below the "soft" limit is free; cases wherein the number of active trunks goes rise above the "soft" limit (but stays below the "hard" onelimit) are allowed, but and in that case, the customer is charged on a per-incident basis. Once the "hard" limit is reached, and nno more calls can beare permitted to be established beyond the "hard" limit. At the end of the billing period all the charges are combined into a consolidated invoice. Any applicable discounts or “committed usage” charges are applied; taxes (local and FCC) are assessed; then invoices are generated and distributed to customers automatically. On their self-care portal, customers can download a copy of their invoice, change their service configuration, browse their call history and also submit online payments via their credit card or an ACH bank debit. To begin with, install PortaSwitch in a private cloud (on your own servers) or sign up for a PortaSwitch SaaS in a public cloud. Since reliability is very important in support of the business telephony services you offer – consider adding a secondary site to ensure 100% service availability. Then, perform the initial configuration of the system (typically there is an experienced PortaOne application engineer to assist you) to define your services, products and bundles. Each product is a combination of recurring fees, per-minute rate plan, bundled (free) minutes, limitations of concurrent calls (trunks) and per-second call attempts. After that, provision customers in PortaSwitch by entering their authorization credentials (IP address or username / password), associated phone numbers and optionally applying anti-fraud measures. Add any value-added services such as call recording. Finally, on your customer’s equipment, assign the high-availability PortaSwitch SBC IP address as the outgoing SIP proxy. 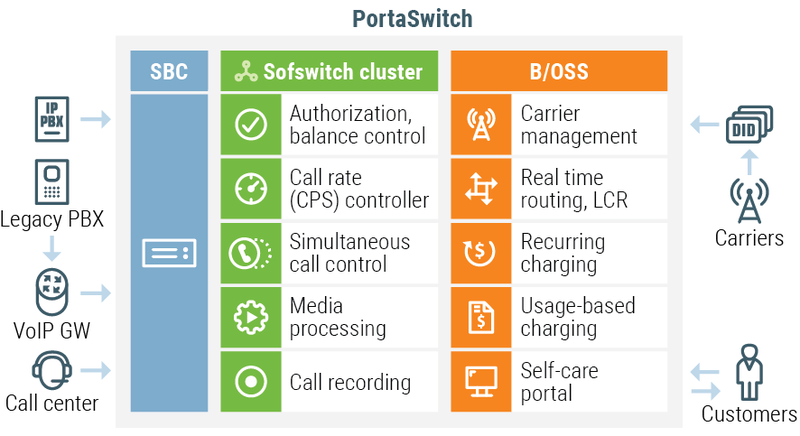 Now any outgoing call from a customer’s office can be delivered to PortaSwitch. It is first authorized then routed to either another IP PBX (for intra-office calls) or out to a PSTN network. Calls made to DID numbers (either local or toll-free) arrive from carriers or DID exchanges and are then routed to the IP PBX which handles that number. Now your customer has a clear overview of all the configuration settings, CDRs and invoices. At the end of each month all applicable fees are assessed, a PDF invoice is generated, emailed and the credit card that’s on file is automatically charged. Additionally, you can increase the revenue by selling to more customers or by signing up the white-label providers (resellers and virtual operators) on your PortaSwitch platform.